subject: real emotional aspects of Y2K: made measureable? That Solves "The Millenium Bug"? Followup on Beth Bridgman's new book "Binary Fusion and the Millenium Bug"
matter") SEE Physics of Phi..
back to sacred geometry main index ..
1 It means one- that more space must be found (compressed) to TIME the date field in binary digits in old computer chips. 2. It means the Solar Magnetism will buffet and compress the Earth in ways that are entirely unprecendented. Fusion is LO-PHI love in the Heart! Binary from two in ONEness. Imagine you are sitting on the park bench when the compression wave arrives (rapture). If electrically you resist spin becoming more dense (fear), then you feel heat (lots of it). If on the other hand you electrically invite in a maximum amount of spin, from the inside out, (compassion), then you experience increasing info density without heat. (rapture). Electrically this skill embeds (nests with leverage) your circuits timing cycle within cycle, wave within longer wave. This Glandular Coherence is CALLED THE EMOTION OF COMPASSION. It is teachable globally using this principle of LEARNED EMBEDDING. This suggests that part of the preparation for HI WINDS solar magnetic and jet stream, is even MOST importantly emotional. Centering force actually may require you to make a little gravity in your heart. Excerpt : "Essentially, in 1999 the time - space portal will finally be open wide enough that people may consciously translate into a higher dimension. These new energies will increase the speed of all atoms making up the physical Earth, and this will have an irreversible effect on electricity. Is the Millennium Bug a mistake or a natural step in the evolution of the universe? Will 01/01/00 bring power outages? Unbridled chaos? Right now, there is no shortage of doom-and-gloomers. But could simple electrical geometry prove that love really is the solution? What people could really use is someone who can explain what it all means. And show them how to replace their fear with love. Enter Dan Winter and Beth Bridgman, two Y2K bug-busters who believe that the millennium bug needs to meet the love bug, HeartLink. That's right-Dan's research, and Beth's story, have demonstrated that by focusing on the power of compassion, love and understanding, the blueprint for creating heaven on earth can start with January 1, 2000. Now, more than ever, these two alternative voices will stand out from the crowd of traditional Y2K experts to give your audience real hope for the future. How compassion, love and understanding will produce better solutions to Y2K conflicts than technology can. How "HeartLink," a simple biofeedback device, can provide the key to overcoming. How their simple "lo-tech" concepts are the results of extensive scientific research. 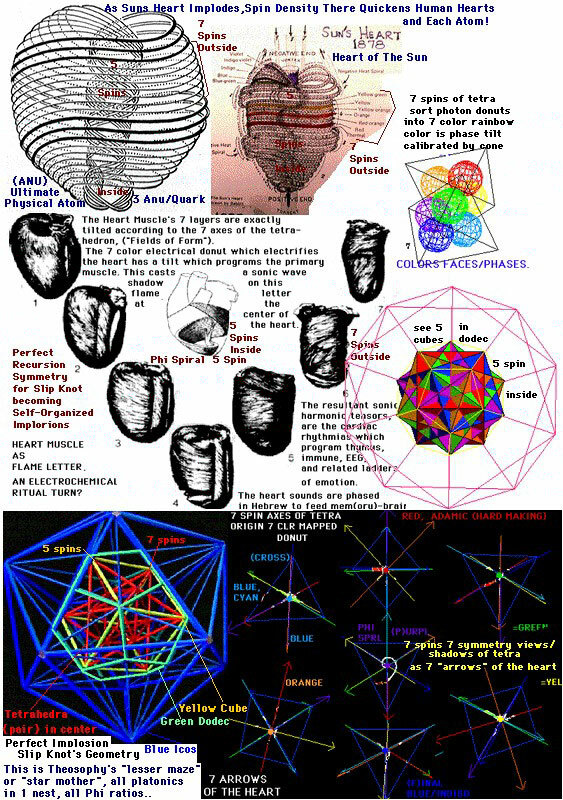 How the simple geometry of heart's energy when you feel wonder or compassion turns out to be the electrical solution to information compression-the Y2K problem solved. How this compression is the creation of heaven on earth. CREDENTIALS: Dan Winter, is a former systems analyst with IBM. He currently serves as a consultant on multimedia and virtual-reality computing projects. Beth Bridgman, (www.esn.net/binaryfusion/ ) author of BINARY FUSION AND THE MILLENNIUM BUG, has a master's degree in education and has previously written children's materials. " AHeartfelt Entrance in to the New Millenium. We provide telemetric and internet feedback from these sites to our media center where a global heads up feedback display is prepared. Magnetic resonance harmonic analysis from three different probe technologies at each site, is converted to a 3 dimensional rotating map of the earth grid. A computer animated revolving map of the Earth's sphere lights up to show which bioregions ring more true in response to global prayer. The image of the earth will be displayed close to real time showing which sites on the planet have lit up with stronger Schumann Resonance long wave coherence. By focusing millions of people with cross coherent EKG imaging the healing of a particular site, it should be possible to teach a global mind, specificity and will, thus creating the rearrangement of the planets magnetic bloodlines like a flower responding to love. in each human, and in each hydrogen anu.. The Merkabbah Meditator's Question:Sacred Geometry of Transcendance- Connected to the in-PHI-knit? There is a "SEEKER" born every minute. harmonics, we accelerate the willed evolution of our DNA." "enclosed" chakra system. An "EGG". Then the Serpent energy "attacks"
Reptilians GAME whom ever they can. Using the same Chakras (wheels of Energy) IF you "crack the Egg"
the "EST" ( The "It Is" / Here & Now). really "afraid" that Humans will "Awaken" and STOP the "parasite"
NOWHERE...because we are already HERE, micro-second to micro-second. The crap Reptilian "New Age" mind control systems will collapse. will MOVE the "Beings of LIGHT" (which we ALL are) into HARMONY ! * Location : The heart area in the center of the chest. * To Awaken and Balance: Serve others, love and take care of yourself. "Timeless/Spaceless" ISNESS. This IS the true SOURCE.